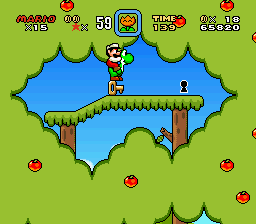 Huzzah, it's my first hack that actually might be released! As well as my first thingy on SMWC in the history of ever! 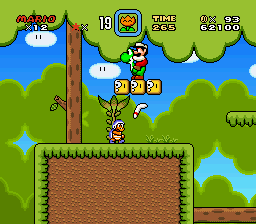 Not to mention me being out of hack names already, even though this is one of my first hacks! Yaaay! ...And the main overworld. 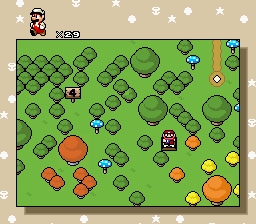 Note that this is very WIP- I haven't even laid out the overworld paths yet. 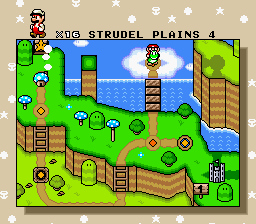 Also, I'm not showing the title screen, as it's just the vanilla SMW title demo with some recycled "SUPER MARIO BROS. 4" text ATM. The first demo is out! It can be found here. 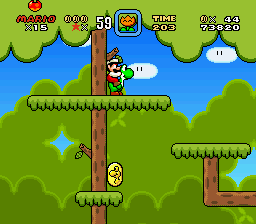 Hello, welcome to SMWC, and while a general rule of thumb on the site is not to typically upload your first hack (then again, you just said it was one of your first hack, not your first hack overall), I can easily say that your hack actually looks very good for a first hack! 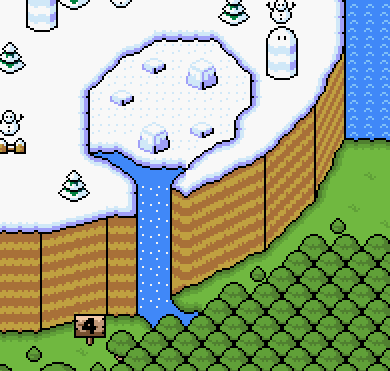 As for the overworld, I also think it looks good, although the transition between world 4 and 5 with the ice could be better. I have a DeviantArt, if you do want to see my art on there. I don't really visit it much now, though. while a general rule of thumb on the site is not to typically upload your first hack (then again, you just said it was one of your first hack, not your first hack overall), I can easily say that your hack actually looks very good for a first hack! Hey, thanks. 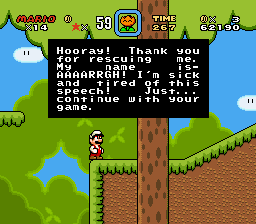 As for the first hack thing, I started a hack called Another Mario Adventure once, but it turned out kinda terrible, so I decided to start it again from scratch and give it a new name, and... now it's this hack. I don't really know if I should use a custom palette for the background, or use completely different ExGFX for it, or if it's fine as is. I might want a couple suggestions. And finally, here's the submap for Sugar Caverns. 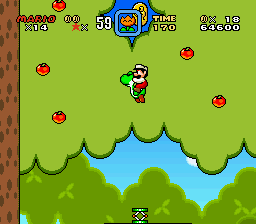 I'm probably going to add a gradient to the background, but I have like zero ASM experience... yeah. Sorry, I haven't done anything for a while due to VLDCX. Not that many people really care. I'm definitely still working on this. Mostly. I, uh... yeah... This is going great... 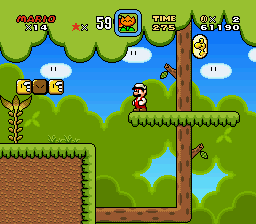 I'm just too... lazy to post a screenshot of the second completed level. Yep. That's it. 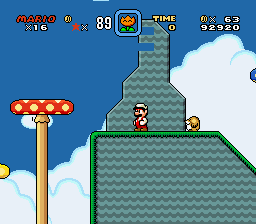 The levels seem decent enough, though without gameplay gifs or videos it's hard to judge. 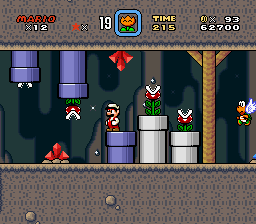 I do think your new pipe graphics would be improved if they kept the vertical white line SMW's pipes have, it makes them look shiny and metallic. 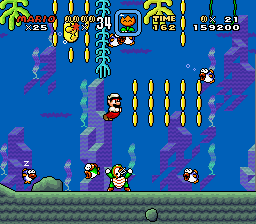 The main overworld has potential. I like what you did with the frozen lake! I know this is a WIP, so here are very general suggestions. 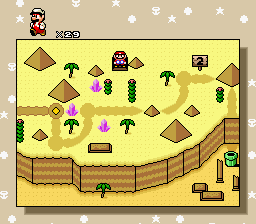 -The whole main map and your cave submap are made up of geometrical shapes (curved and straight lines) that don't look very natural. Look at the shape of islands and landmasses in SMW's overworld, for contrast. -Factories look really flat and could use some perspective. 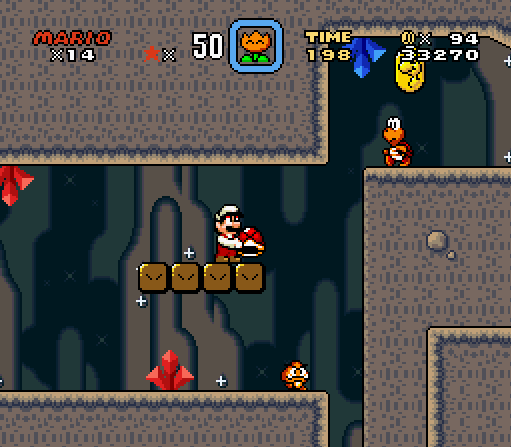 -Cave lava should have lighter, yellower edges, not darker ones. But honestly, and this is waaaay more subjective... I think it would be both easier and cooler to have the waterfall land in an underground lake instead of a bottomless pit. Just fill the blankness with water, and use rock to separate it from the lava continuing its own way. 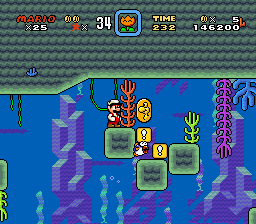 This way you could have stalagmites rising from the water instead of from offscreen. As you can see, I figured out how to insert HDMA properly, which will help a lot in the future. 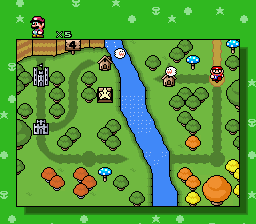 That small square island on the world 1 submap will house the Yellow Switch Palace, and I don't really know what else to put there. Maybe a cloud...? 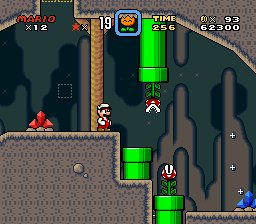 As for the cave submap, I have no idea why the background is green. I used no green in the backgound at all. 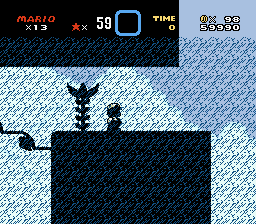 Yeah, I'm sure I'll figure out how to fix the layer 3 thing soon, as well as actually build the rest of the level... 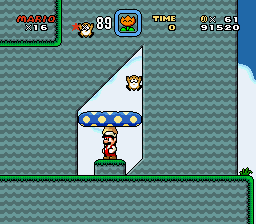 The reason the BG is so bright is because I used the Lightning Generator custom sprite in the level. The whole thing looks very good. 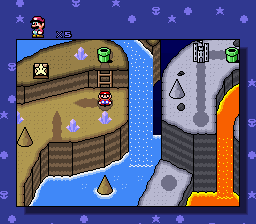 The overworld maps look slightly better. 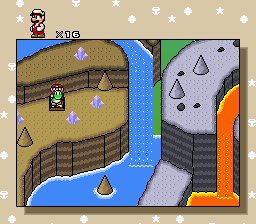 I'm still wondering why the cavern submap has green color. Maybe it's an effect of HDMA fail. 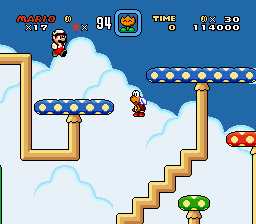 I like your last level. Looks better with HDMA imo. I told you I would be working on this faster. I'll probably get the Plains Secret Area and the YSP done for the next update. Until then, some feedback would be appreciated or something. Don't tell me you still don't know how to fix the issue. 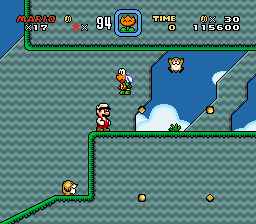 Speaking of issues, the level looks lacking of coins. 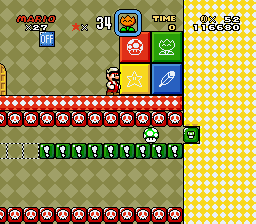 This isn't really important, but you will fill the empty space in the level. Outside that, you're doing really good with your first hack! Yes, I know there's no way I'm getting a demo released for C3. And no, I don't care about C3 at all. 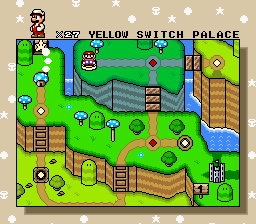 Here's the Yellow Switch Palace, which focuses around getting a 1-up mushroom to the goal block at the end. 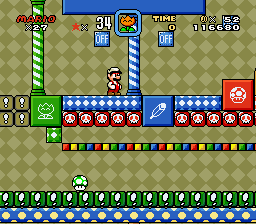 It introduces the ON/OFF solid blocks, which do what you would expect, the skull blocks, which instantly kill Mario/destroy sprites, and the goal block, which teleports you to the switch room when the 1-up touches it. 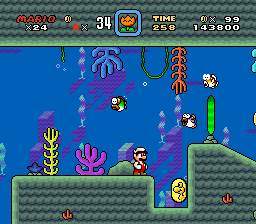 It also re-uses the blue mushrooms from the previous level. Yes, this is quite difficult, and I'm sorry for that. Next, we have the Plains Secret Area. 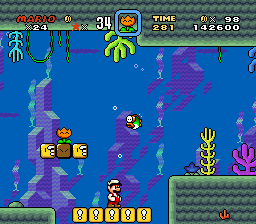 It's the first water level in the game, as well as the first level to use the yellow switch blocks, and bullet bill launchers. For whatever reason. 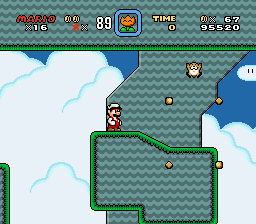 I tried placing coins in this level this time, but I don't know if it worked out. 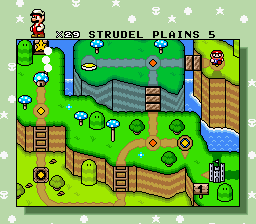 Feedback would be appreciated, as usual, and I'll try to get Strudel Plains 5 done next. Switch palace looks really nice, but I think the third screenshot from it should be a tad bit easier. 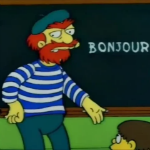 Other than that, everything's great! Okay, here's part of the first castle. It isn't done yet, but that's why I'm only showing part of it. And, it's a gif, because I'm trying to stay at zero uploads on youtube, guys. Seriously. I haven't made as much stuff as promised for C3. I wanted a castle tileset yet, but there were some real life issues. 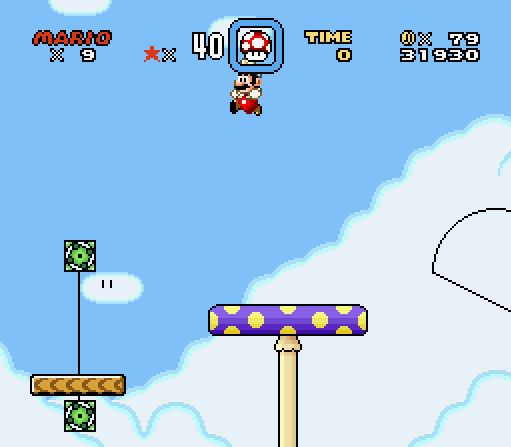 Aside of that, nice levels and maps! I think it's pointless to make such a long GIF like that. It'd have been better if you had spread this in a few screenshots. Why do you want to stay on 0 uploads for now? How come every level in the city world is a factory? Does the beach world connect ALL the way up to the sky world? 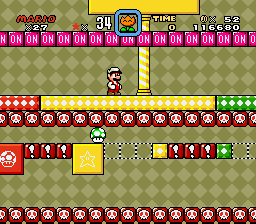 Where did you find those "screw" blocks/sprites? The map also looks a little... polygonal. That's not a bad thing, but it just looks kind of weird. 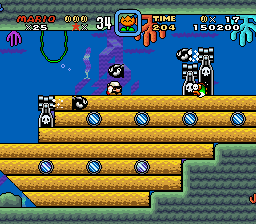 EDIT: just noticed the pipe between the beach and sky world. I haven't laid out the paths for the city world yet. 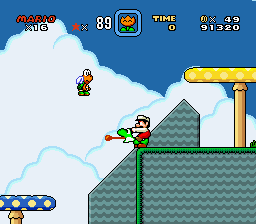 The only factory levels are the one with the smoke coming out of it and the darker one, and the former is the castle for that world. 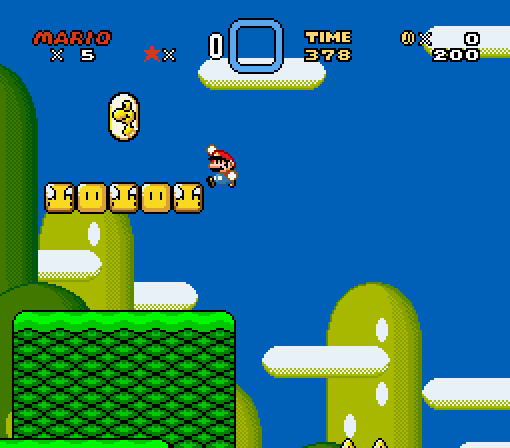 Also, the screw blocks are reskinned versions of these. Finally, I tried the best I could to make that map. 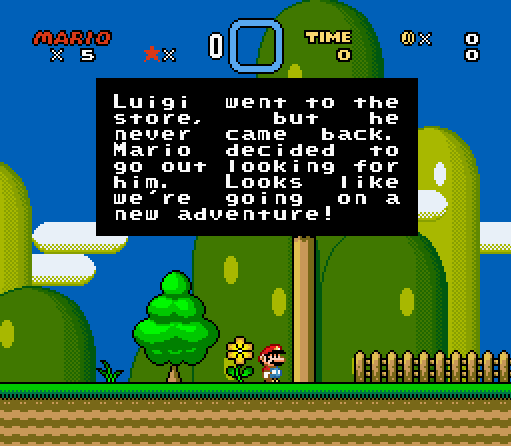 This is my first hack, after all. Hmm... 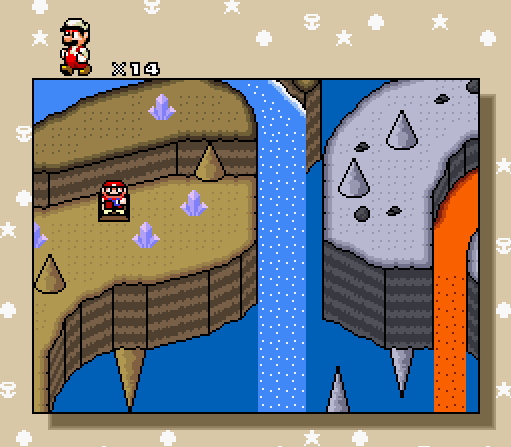 I seem to have been working on the overworld more lately. 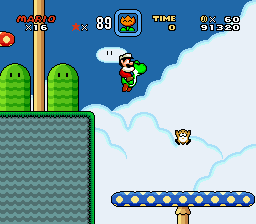 Not that that's a bad thing, but I should kinda be focusing on the levels, and not the overworld, since I'm planning to release a demo in a week or two seeing how close I am to finishing world 1. I promise I'll get back to level building soon. 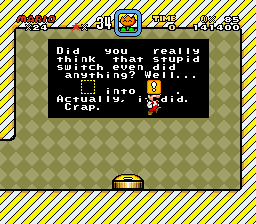 Of course, I'm not that inclined to get the world 7 area done because when I try to insert the factory map music from vldc8, it gives me a blank error that I don't know how to fix. 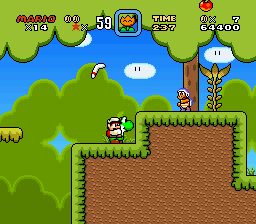 That being said, I did figure out how to use the "multiple songs on main map" patch, so that's pretty nice. I spent a whole 10 minutes hand-drawing those city world graphics, which were based off of those from NSMW1. Because that hack will always be better than this one. 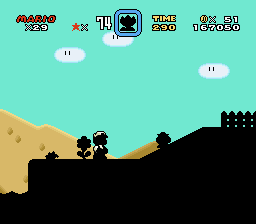 Oh, yeah, and the cave background HDMA works now, somehow. Even though I never changed anything with it since the time I took the last screenshot. Holy cow! 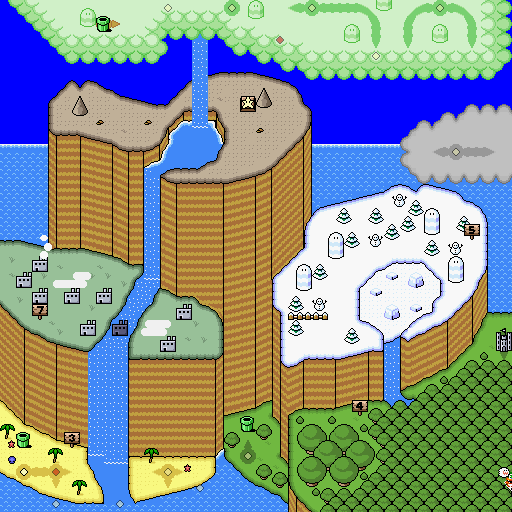 Your overworld looks overwhelmly good! Though idk how to fix that issue with music in the main map. Maybe use another port/composition? Well I can't wait to play the demo. And I agree with user23507. 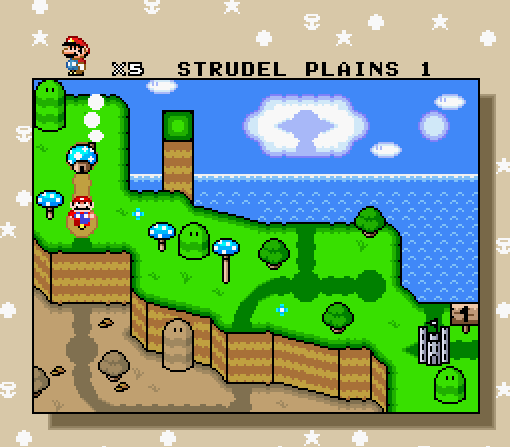 That overworld is sick. Especially the snow one.